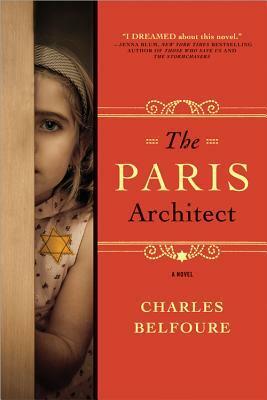 Charles Belfoure writing is poignant, historical accurate and heart wrenching. His paints a realistic picture that captivated me with its tone, setting, and the strength of its characters. He writes with such heart felt emotion, that I was through a box of tissues before I even know it. This book is a haunting depiction of Jewish survival and how two very different men come together to help hide Jews, in a time when there really wasn't any safe place or haven for them. Lucien Bernard, is an unemployed architect during the German occupation of Paris, who is offered a job that is technically challenging but extremely dangerous. He must construct a hiding place similar to the Priest Holes that were used during the reign of Elizabeth the first, when being a Catholic priest was a death sentence - so hidden rooms were constructed to keep practitioners and clergy safe from discovery. Lucien is at first rather disgusted and appalled; regardless of the pay, this assignment could get him killed, especially when one of the buildings he is commissioned is across the street from Gestapo headquarters. Although he is not particularly fond of Jews, Lucien accepts the assignment because of its a financially lucrative offer. His employer introduces him in to the German HQ and soon Lucien is planning German war factories. This is a book that will stay with me for some time as Charles Belfoure's descriptions of the cruelty the Gestapo inflicted on Parisians and the Jewish people is haunting- there hunt for food, the fear they must have constantly felt and the strength people showed in their resistance to the inhumanity that was forced upon them.